In the summer of 2013, the Nigerian military, as part of its counterinsurgency operations against Boko Haram insurgents, shut down GSM mobile telephony in three northeast states – Adamawa, Borno and Yobe. This article explores the rationale, impact and citizens’ opinion of the mobile phone blackout. It draws on focus group discussions with local opinion leaders and in-depth personal interviews with military and security insiders, as well as data of Boko Haram incidences before, during and after the blackout from military sources and conflict databases. It argues that, although the mobile phone shutdown was ‘successful’ from a military- tactical point of view, it angered citizens and engendered negative opinions toward the state and new emergency policies. While citizens developed various coping and circumventing strategies, Boko Haram evolved from an open network model of insurgency to a closed centralized system, shifting the center of its operations to the Sambisa Forest. This fundamentally changed the dynamics of the conflict. The shutdown demonstrated, among others, that while ICTs serve various desirable purposes for developing states, they will be jettisoned when their use challenges the state’s legitimacy and raison d'être, but not without consequences. New ICTs have fulfilled various desirable purposes for Nigeria, Africa’s largest economy. Nigeria’s social, economic and technological nervous systems now depend on the Global System of Mobile communication (GSM) – introduced in the country in August 2001. Since then, according to the Nigerian Communications Commission (NCC), mobile telephone usage has increased exponentially, rising from 8.5 per cent in 2004 to 92.14 per cent in 2014 (NCC). Nigeria now has Africa’s largest mobile phone market with 167 million connected GSM lines (NCC). Billions of dollars have been invested in Nigeria’s mobile phone industry resulting in the construction and deployment of additional base stations, fiber optic networks and various other infrastructure components. Prior to GSM, Nigerians depended mainly on landlines provided by the state-owned monopoly, Nigerian Telecoms (NITEL). But with the growth of mobile telephony in Nigeria, fixed land telephony has declined. There are just over two million fixed telephone lines in Nigeria, out of which only 357,612 are active.1 With the decline of fixed line telephony, government departments and functions, including security and law enforcement agencies, now depend almost entirely on mobile telephony. Mobile telephony has also become a part of social practice across Nigeria, and has been adopted by the government for governance and development. For example, the Ministry of Agriculture maintains a database of the mobile phone numbers of farmers in the country. The ministry texts vouchers to farmers on their mobile phones, which the farmers then use like cash to buy farm inputs, including fertilizers and seeds. While mobile telephony has functioned as a tool for development, it has also served as an enabling tool in the hands of insurgents. Since 2009, the Islamic sect Boko Haram2 has carried out a ferocious resistance against the Nigerian state, leading to the death of more than 2,000 Nigerians in 2014 alone, along with several hundreds of thousands of individuals displaced (NEMA 2015). Many of the sect’s attacks have been coordinated and assisted by mobile telephony. As part of the state’s counterinsurgency (COIN) measures, a state of emergency was imposed in May 2013.3 During this time, Nigeria’s security forces shut down mobile phone networks in Adamawa, Borno and Yobe states in northeast Nigeria between 23 May and 12 July 2013. This study undertakes an assessment of the impact of the mobile phone ‘capture’ and the various coping and circumventing strategies developed by Boko Haram, law enforcement agencies, private organisations and citizens in the region. While it was the first time that the Nigerian military undertook such a drastic step to enforce state authority, it is not the first case of state disruption of citizens’ ICT access as a means of seeking to enforce state legitimacy. In 2011 and 2012, during the so-called Arab Spring, unpopular regimes in North Africa captured the Internet in response to citizen efforts to use social media as a mobilization structure in their protests (Filiu 2011; Ghonim 2012; El-Bendary 2013). Although the North African cases, as well as similar ICT disruptions by authoritarian regimes in Myanmar, Iran and Syria, were enforced to prevent or disrupt mass protests and citizen unrest rather than in response to an insurgency effort, they offer an interesting antecedent to Nigeria’s ICT capture. While ICTs serve various desirable purposes for developing states, they are easily dispensed with when such ICTs challenge the regime’s legitimacy and authority. This research explores the impact of the shutdown in Nigeria and its implications on contemporary debates on ICTs and governance, particularly in Africa and other new democracies. The work draws on focus group discussions with local opinion leaders in Adamawa State of Northeast Nigeria, as well as in-depth personal interviews with security agents, experts in security and information technology, senior civil servants, and members of the so-called Civilian Joint Task Force (JTF), made up of local vigilantes and former Boko Haram members now working as informants for Nigeria’s security forces. The following background section provides a much-needed context to the Boko Haram insurgency and to mobile phone usage in Nigeria. This is followed by the methodology section which discusses the methodological approaches, after which the main findings are presented. The final section discusses the findings further and locates them within the larger architecture of debates on ICTs and governance in contemporary society. As earlier noted, this section provides a background to the Boko Haram insurgency, including the origins of the sect, their ideology and their interactions with mobile phone technology. It also discusses the context of mobile phone usage in Nigeria, arguing that mobile telephony has become part of social practice in the country, thereby re-ordering patterns of social relations and enabling even the rural poor to, on their own terms, re-order what Giddens (1981) calls time-space distantiation. Boko Haram broke into the global limelight in April 2014 after the group raided a state secondary school in Chibok, Borno State and abducted 276 schoolgirls. The abduction sparked a global social media movement and the hashtag #BringBackOurGirls. Prior to this date, very few people outside of Nigeria knew much about the group. The name Boko Haram is an alias for the Islamist sect Jama’atu Ahlis Sunna Lidda’awati Wal-Jihad – (People Committed to the Propagation of the Prophet’s Teachings and Jihad). The sect was nicknamed Boko Haram in 2002 by residents of Borno State in Northeast Nigeria because of the fiery anti-Western sermons of its former leader, Mohammed Yusuf. Boko Haram is a combination of the Hausa word ‘Boko’ meaning Western schools (or education) and the Arabic word ‘Haram’ which means sacrilege or forbidden. The translation of Boko Haram as ‘Western education is sinful’ is a transliteration of the two words, but the intended expression is Western civilization is a sacrilege or forbidden (Adibe 2013; Mantzikos 2010). Essentially, the group is opposed not only to Western education but to the entire superstructure of Western civilization and its various appendages and influence, including democracy, civil law, human rights, language, etc. Details on the group’s origins are disputed, but the popular belief is that it was founded in 2002 by Ustaz Muhammed Yusuf. Until his death in 2009, Yusuf embarked on a massive recruitment drive, drawing membership mainly from the Kanuri speaking tribe in Northern Nigeria. He drew on the local anti-Western sentiments, poor education and pervasive poverty in the region and established mosques, Islamic schools and associations that gave thousands of disenfranchised Muslim youths a sense of purpose and a means of expression. But membership was not limited to poor and disenfranchised youth. At the time of Yusuf’s death, Boko Haram had more than 500,000 members spread across northern Nigeria (Adibe 2013). The sect drew membership from various fields of endeavours, ranging from the military to government, politics, banking, etc. The argument that youth disenfranchisement and unemployment is primarily responsible for the rise and endurance of Boko Haram is not entirely accurate because a significant number of people that joined the sect were gainfully employed. Some were paying membership dues on a weekly and monthly basis. It is also misleading to claim that the sect has endured because of poverty and lack of access to education in northern Nigeria. Since the Maitatsine Islamic revivalist movements of the 1980s, there have been various Islamist groups that have emerged in northern Nigeria and were either subdued militarily or hijacked by politicians. It is important to point out, however, that prior to July 2009, Boko Haram operated peacefully and was ostensibly committed to fighting injustice and supporting ‘true’ Muslims to achieve positions of political authority in northern Nigeria. The sect’s terror activities started in 2009 after a military clampdown resulted in the death of about 800 sect members, including its charismatic leader Mohammed Yusuf. The clampdown occurred after members of the sect clashed with local police in Maiduguri when the police attempted to arrest some members for defying a ban on riding okadas (motorcyles).5 The clash coincided with police investigations of the sect’s activities and claims that the sect was secretly arming its members. Yusuf was killed in police detention after he had been captured alive by the military. Since then, the group, under its new leader, Abubakar Shekau (aka Darul Tawheed) has carried out series of attacks on civilians, military posts and government buildings. Its objective is to impose a pure Islamic state in northern Nigeria guided by strict Sharia law. In August 2014, the group declared Gwoza, a boundary town in sourthern Borno it had earlier captured from Nigerian forces, as the headquarters of a new Islamic caliphate. Boko Haram sees Western influences as a basis for the weakness of Islam (Onuoha 2013). Its ideology has its roots in Salafi jihadism and driven by Takfirism. This ideology seeks to return Islam to the original practices of the Prophet Muhammed and early Islamic clerics by purging the religion of Western influence. Salafism sees violence as an acceptable tool for jihadism. In Takfirism, Muslims that do not follow their ideology are seen as kafirs or infidels or even worse, as kufars or disbelievers. This explains Boko Haram’s seemingly indiscriminate attacks on Muslims and Christians as well as Islamic clerics that criticize their activities. To them, ‘moderate Muslims’ should be treated as infidels.6 The sect is now renowned for attacking schools, police and military posts, churches, mosques and palaces of traditional rulers that do not support their ideology. One of the fundamental capabilities of Boko Haram has been its element of surprise. They have been successful in multiplying their force through their detailed knowledge of the difficult and sometimes inaccessible terrains in Borno and the border hills between Nigeria, Cameroun, Chad and Niger. They are mobile and fluid; before August 2014, when they declared Gwoza the capital of the new Islamic Caliphate, they did not have a well-defined territory or communication infrastructure that could be targeted. Moreover, they have stronger levels of endurance than their military pursuers. Their ideology impels their aggression and unrelenting pursuit of martyrdom. The military clampdown of 2009 to 2012 forced the group to disperse and go underground. Since their dispersion, an essential survival kit for the sect has been its ability to coordinate their activities across dimensions of space and time. Building on Giddens’ (1981) previous works, Thompson (1995) has written eloquently on the instantaneity of mobile communication, which eliminates temporal delays in the mediation of symbolic forms. A new ‘simultaneity’ is introduced not only into social life but also to violence and insurgency. For insurgent groups like Boko Haram, this capability is essential for planning and executing attacks, surveillance, timing and the precision of surprise. Boko Haram relies on the ‘simultaneity’ of mobile communications to coordinate attacks and activate cell members based at locations proximal to the target. By bridging temporal and spatial dimensions of their activities, the sect achieves simultaneity in attacks – a capability it has perfected in carrying out dummy and active raids. In dummy raids, the sect raids a particular location to distract attention of security forces while another unit goes on to carry out a larger attack on key targets. For example, on the night of 14 April 2014 when Boko Haram raided the Government Secondary School at Chibok that sparked the global #BringBackOurGirls campaign on social media, its operatives had detonated a car bomb in Nyanya Abuja that killed scores earlier in the day. A similar pattern played out on 24 May 2014 when the group detonated a car bomb in Jos, Plateau state and in the same night carried out series of raids in Kamuyya villages in Biu Local Government area of Borno state, killing more than 20 people and abducting several others. There have been several such cases. The ability to coordinate operations and cells across spatially remote locations is at the heart of Boko Haram’s diffusion of terror in northern Nigeria. It is important to note, however, that Boko Haram has undergone various metamorphoses in response to tactical exigencies on the ground and its overall strategic objectives. In response to Boko Haram’s acts, and with a paucity of consistent and credible human intelligence on the sect’s operations, Nigeria’s security agencies have been compelled to rely on enabling technologies to tap phone lines of suspected terrorists and their backers. The Nigerian government’s first step was to seize control of the more than 150 million mobile telephone lines in the country. To achieve this, the government in 2011 mandated the NCC to register all mobile telephone lines in the country. According to the NCC, the objectives of the mandatory national SIM registration exercise were to ‘enhance the security of the state’ and to enable operators to have ‘predictable profile about the users in their networks.’ SIM registration started on 28 March 2011 and ended officially in January 2012 after which all unregistered SIMs were deactivated. With this information, the intelligence gathering capability of the Nigerian security services was remarkably enhanced, and a number of key Boko Haram commanders were captured, including Sani Mohammed, Kabir Sokoto and Shuaib Mohammed Bama (who was arrested in the home of a popular politician) (Vanguard Newspaper 2012). In response, Boko Haram embarked on a campaign of attacks on telecommunication base stations both as revenge and in an effort to discourage telecommunications companies from cooperating with security agencies. In September 2012 the sect claimed responsibility for the coordinated bombing of telecommunication base stations in four northern states – Borno, Yobe, Bauchi and Kano. According to Abu Qaqa, a spokesman for the sect, the installations were targeted as retaliation for the telecommunications industry’s cooperation with the state security services to reveal their locations and phone conversations. He said, ‘We are attacking GSM companies because they have helped security agencies to arrest and kill many of our members and we will continue with our attacks on them until they stop’ (Premium Times 2012). Since then, Boko Haram has carried out several attacks on infrastructure that supports mobile telephony in Nigeria, notably base transceiver stations (BTS) (or masts), both for revenge and for tactical reasons. In 2012 alone, 150 BTSs or telecom masts were damaged by Boko Haram (Onuoha 2013). According to Onuoha (2013), the strategic objective of the attacks on telecom infrastructure ‘is to choke one of the supply lines of intelligence to Nigeria’s intelligence and security system’ (23). Indeed, Boko Haram was the first to enforce targeted mobile phone blackouts for tactical purposes before the Nigerian military. The sect regularly attacked mobile phone masts to enforce mobile phone blackouts and prevent raided communities from calling for help from security forces. This suggests that Boko Haram was using alternative means of communication, at least within the areas where mobile telephony infrastructure had been targeted. It is curious, therefore, that the Nigerian security forces saw the mobile phone blackout, a usual Boko Haram tactic, as a means of containing the insurgency. On 14 May 2013, after a series of attacks on various targets in northern Nigeria, the Nigerian federal government declared a state of emergency in the three northeastern states to enable the military to intensify COIN operations. The edict was intended to quarantine the conflict to the region and also to provide the military with broader powers to deal with the insurgency. The state of emergency gave the military superior powers over the civilian arms of government in the region. In his declaration of the state of emergency, President Goodluck Jonathan said troops and other security agencies involved in the state of emergency operations have orders to ‘take all necessary action, within the ambit of their rules of engagement, to put an end to the impunity of insurgents and terrorists’ (Premium Times 14 May 2013).7 During the state of emergency, the military are able to make arrests without having to first secure a warrant. They can stop and search anyone or any vehicle, detain suspects longer than 24 hours, break into private properties without search warrants and carry out any other such activity it deems necessary to fulfill its mandate. On 23 May 2013 the military shut down mobile communications in the three northeastern states. The mobile phone blackout was limited to GSM. According to the military, the objective of the shutdown was to limit Boko Haram’s communications capabilities, restrict their ability to regroup and re-enforce and also limit their ability to detonate improvised explosive devises. During the blackout, State security forces developed new ways of communicating. The Nigerian police, for example, deployed an alternative mobile communication system using Code Division Multiple Access (CDMA) on Global Open Trunking Architecture (GOTA) from the Chinese manufacturer ZTE. Since it was only GSM lines that were blocked, it was possible for the police to use CDMA with ease. The GOTA phones were distributed to police officers in northeastern Nigeria just before the mobile phone shutdown. This enabled the police, along with other state security units, to circumvent the shutdown. Initially, the state of emergency seemed successful, as members of the sect were driven from Maiduguri and its environs to the vast and treacherous Sambisa forest. The sect eventually turned the Sambisa forest, four times the size of London, into their stronghold. More recently the sect has advanced from Sambisa to capture and control territories in Borno, Adamawa and Yobe states. Although the standard of living and level of income in northeast Nigeria is far below the national average, mobile telephony has a comparably high penetration. Radio remains the most popular communication medium in northeast Nigeria, but mobile phone has achieved quite high penetration in a relatively short time. See Figure 1 below. ICT Access in Northeast Nigeria. Source: Nigeria Bureau of Statistics. In addition to the routineness of mobile phone use as a function of a strong oral culture, there is the element of family closeness. Families in northeast Nigeria generally maintain unusually strong ties even across extended families. Particularly among low income groups, calls to family members make up a substantial part of daily mobile phone talk time. Despite the various functionalities of the mobile phone (which may include other non-call functions such as internet data, calendar, reminders, SMS, etc. 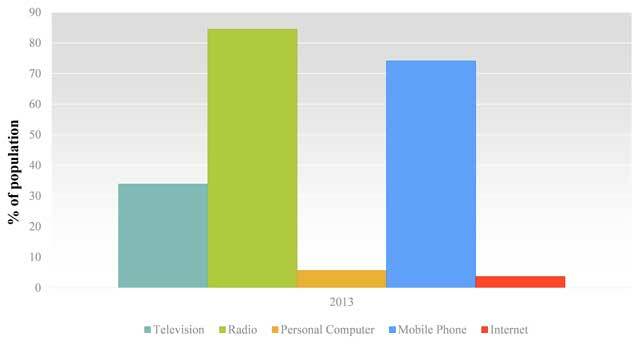 ), talk remains the major, if not the only, function of the mobile phone for most people. The Boko Haram insurgency in northeastern Nigeria has had strong impacts on social life and on the use of mobile telephony. Although local people normally call their family members many times in the course of the day, the insurgency has increased the number of such phone calls. Most parents now provide their children with mobile phones so they can know about their welfare in the course of the day. It is not uncommon for parents to now call their children at school twice during the 9am-3pm school time. Low literacy also accounts for the high voice call volume in the northeast region. The region has one of the lowest literacy rates in Nigeria. Whereas some conversations or enquiries at other regions would normally be expressed via SMS exchanges or via BBM, Whatsapp or other SMS platforms, people in the region prefer to call instead. This accounts for the unusually high expenditure on mobile telephony in the region. According to a senior management official of one of the popular mobile phone companies in Nigeria, the company lost some 5 million dollars (800 million Naira) in call time recharge revenue in Adamawa State alone during the period that mobile phone service was shut down. 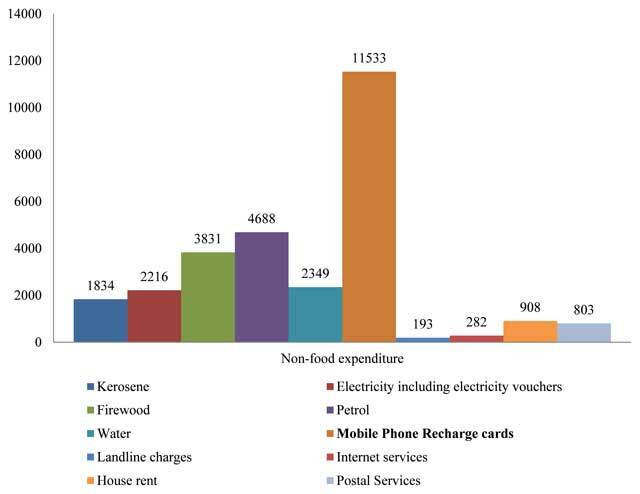 In the northeast region, mobile phone recharge card accounts for the average highest monthly household non-food expenditure – higher than expenditure on electricity, water and house rent combined. See Figure 2 below. Comparative Expenditures on Average Monthly Non-Food Items in Households in Northeast Nigeria (in Naira, 2013). Source: Nigerian Bureau of Statistics & African Development Bank. Whereas in Western developed societies mobile telephony developed through various processes of adoption – co-evolving with various other communication technologies such as landline telephony, fax, pagers, first generation (1G) cellular phones, internet, etc. – the adoption of mobile telephony in northern Nigeria, like in several other African societies, skipped these development rungs. Users in northeastern Nigeria leapfrogged from face-to-face social interactions within a shared physical space and time to mobile telephony. Prior to the mobile phone, relationships were primarily oral based and had to be constantly renewed. Interactions were generally open ended. The introduction of mobile telephones, however, enabled the evolution of new forms or modes of interactions. The nature and modes of interpersonal communications and relationships co-evolve along with emerging technologies. In northeast Nigeria this co-evolutionary process was rather disjointed, as most people moved suddenly from face-to-face communication to technologically-mediated interpersonal communications. This resulted in patterns of open-ended social relationships, with their various eccentricities, moving onto new modes of interaction brokered by the new mobile telephone technology. Patterns that characterize daily face-to-face conversations – pleasantries and banter, including enquiries about the welfare of each family member, businesses or livestock, as well as what is called ‘hailing’9 in Nigeria – were also carried onto mobile phone conversations. Mobile phone talk time, despite the unusually high cost, is not limited to the specific purpose for which the call was made, but usually, conversations meander through a mesh of banters and ‘hailings,’ typical in face-to-face encounters. The methodological approach used in this study was designed to achieve a deeper awareness of the nature of impacts of the mobile blackout on citizens and on the insurgency itself. The methodology included focus group discussions (FGDs) with local opinion leaders, in-depth personal interviews with military and security insiders and an analysis of data aggregates on attacks obtained from government and military sources, as well as conflict databases including the Council on Foreign Relations (CFR) databank on the Boko Haram insurgency. To develop a clearer awareness of the nature of impact the mobile phone shutdown had on local people, FGDs were conducted with local opinion leaders (or ‘influentials’) in Adamawa State. Six FGDs were conducted between April and May 2014 with participants drawn from three geographically bound contexts or towns as primary units in Adamawa State (Jimeta, Yola town and Fufure).10 For security and logistical reasons it was not possible to carry out FGDs in all the three states. However, residents from the three towns selected—all of whom were subject to the mobile phone shutdown and to Boko Haram threats—shared similar demographic characteristics with residents in the other two northeast states, including religion, occupation, ethnicity and levels of education. The smallest group had six participants while the largest had nine, for a total of 46 participants. It was important that focus group participants be influentials or opinion leaders in their communities in order to have well-informed discussions. In this study, influentials, a term used by Keller and Berry (2003) for opinion leaders, were defined by their information-seeking and -giving behaviour at personal and community levels. These elements of opinion leadership and its consequences for social embeddedness and political participation have been well articulated by Burt (1999) and Rogers (2003). Information-seeking behaviour was defined in terms of participants’ ownership and consistent use of mobile phones, level of exposure to the local media and other informal or social information transmitters. Information-giving behaviour was defined in terms of influentials’ ability to inform members of their network. Social embeddedness in the study is defined in terms of the density of ties that participants had within and outside of their networks and the level of their social relations and community participation (Weimann 1991; Knoke 1990a, 1990b). The purpose of using influentials with these characteristics was to ensure that opinions gathered from focus groups were from people that would normally have used their mobile phones not only for personal desirable causes, but also for community causes. Based on the above, Nisbert’s (2006) refinement of Kelly and Berry’s (2003) engagement model of opinion leadership was adapted in selecting local influentials for focus group participation. Originally developed by Roper ASW, the model identifies opinion leaders based on a number of indicators ranging from civic engagement or political activism to social embeddedness. The activities were adapted into checklists (Table 1) and randomly distributed to respondents within the selected towns in Adamawa state. Respondents were asked if they had engaged in any of 8 activities within the previous 12 months. Any respondent that answered ‘yes’ to activities one and two and to at least one of the other six engagement activities was pre-selected within their contexts for the focus group discussions. To be part of FGDs it was essential that participants own and actively use mobile phones and were resident in Adamawa state during the mobile phone shutdown. Additionally, participants had to demonstrate that they are active and influential members of their own communities. 1. Have a mobile phone and use it consistently. 2. Have been a resident continually in their community in Adamawa state for the past one year (including the period of the mobile phone disruption). 3. Attended a political rally, speech, or organized protest of any kind. 4. Been an active member of any group that seeks to influence public policy or government. 5. Held or ran for political office. 6. Been a member of the Adamawa Peace Initiative or attended a public meeting on community peace-building or reconciliation matters. 7. Served on a committee for a local organization. 8. Met secretly or openly with other members of their network to seek the interests of the community. Using the engagement model in selecting participants was informed by the need to gather participants that were not only embedded, but also engaged in their social contexts as thought leaders. Embeddedness opens access to giving and receiving information (Jacob 2010); moreover political information is circulated not only through organised media, but also through informal social interactions within structured patterns of the society (Nisbert 2006). Although this model was originally tested in the United States (Keller and Berry 2003) and in Europe (Nisbert 2006) it is reproducible and can be suitably adapted across various socio-cultural contexts to select influentials. It has been used by Jacob (2010, 2014) to select influential radio listeners as focus group participants in the Democratic Republic of Congo. Indeed, as Marshall and Gitsordarmo (1995) have argued, some characteristics of opinion leaders are consistent across contexts. After testing a scale of opinion leadership across eight countries, they observe that opinion leaders indeed share common characteristics across cultures. Such characteristics include higher media exposure, political interest and sociability. This section discusses key findings of the study. Firstly it explores the military’s opinion of the impacts of the shutdown and secondly citizen’s assessment of the impacts of the shutdown. It argues that whereas the military felt that the shutdown was successful as a means of preserving state authority and legitimacy, citizens felt it was a ‘dumb’ strategy with severe social and economic consequences. The insurgents were using the phone to their advantage. It was more of [an] advantage to them [than to the public]. We have GSM tracking mechanism. We tracked a lot of their communication prior to attacks. They used mobile phones to coordinate. So we were able to track them. We realized it was of more harm than good to the public. The moment we shut down communication, there was a lull in their operations. We [the military] had alternative means of communication and they didn’t. The moment we shut down GSM communication, we were able to carry out successful raids and cordon and search operations on so many Boko Haram camps. We caught them unawares. Using mobile phones to coordinate their activities made it look as if they were everywhere. But they are not everywhere, they communicate to people from different camps (or cells) where they have people. When they want to carry out an attack, they call their members within that location, muster them together and they face a particular town. When they want to go out on a wide offensive, they normally use mobile phones to bring themselves together and carry out their attack. I can tell you the mobile phone shutdown was successful. During that period their attack was reduced to a minimum. Although we successfully tracked calls and helped to effect arrests of insurgents, the way Boko Haram used mobile phones made it essential to shut down the network. Insurgents were captured and those not captured were too afraid to operate within their cells without any coordination from outside. So many of them retreated and fled. They were unable to call for help and reinforcements when security agents closed in on them. So mobile phone shutdown was important to our counter-insurgency operations at that phase of Boko Haram insurgency. It was a clearly thought out strategy to stop Boko Haram momentum. Security overrides everything else. Social communication can only be done in the atmosphere of peace. Security supersedes everything else. If shutting down mobile lines is needed for security then people must accept it. It is a sacrifice everyone must make. This position generally illustrates the posture of Nigeria’s security operatives and government in general. ICTs, human rights and personal freedoms are valued as part of development and democracy, but the state is more than willing to jettison these values to enforce the state’s legitimacy. Official statistics from military sources and data from CFR databases appear to support the claims that the shutdown was effective, demonstrating a significantly smaller number of Boko Haram attacks during the period of the mobile phone shutdown – from 23 May to 12 July, 2013 – compared with the previous three months. Whereas there were a total of 52 Boko Haram incidences or attacks in the previous three months, during the shutdown there were only 26 incidences across the region. In the three months after the shutdown, attacks increased to 40. There was also a reduction in deaths from Boko Haram attacks to 124 from 519 deaths in the previous three months. When phone networks were restored, the number of Boko Haram attacks and casualties increased. See Figure 3 below. 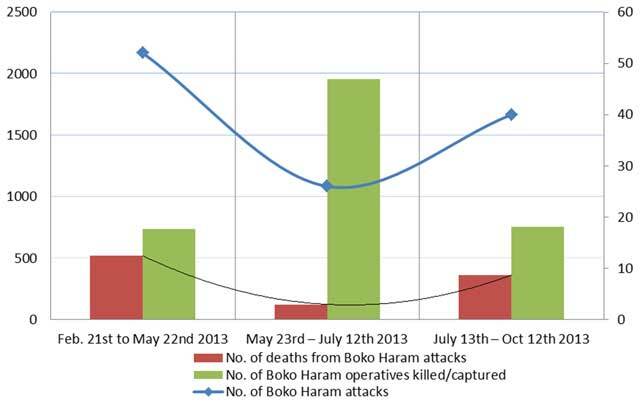 Boko Haram incidences before, during and after the mobile phone shutdown in Northeast Nigeria. Source: Nigerian Military & CFR. Security agencies attributed the reduction in the number of incidences and casualties from 23 May to 12 July 2013 to their disruption of Boko Haram communications during the period. According to military officials interviewed, however, the most significant indicator of the success of the tactical blackout of mobile phone networks is the number of Boko Haram operatives captured or killed during the period. The military captured or killed 1,956 insurgents during the period compared with 734 the previous three months. While there are no specific reasons to question the validity of military data in this instance, it is important to locate these figures in context of the fact that Nigerian security forces have been accused of arbitrary arrests and extrajudicial killings (Amnesty International 2014). The Nigerian military has consistently denied the allegation. It should also be noted that in most counterinsurgency operations, there are always allegations of human rights abuses including unlawful detentions, torture and extrajudicial killings. The UK and the US have not been exempted from such accusations in the past. While military officials attribute the achievements during this period to the mobile phone shutdown, other factors could have played a role as well. After the declaration of the state of emergency, there was a troop surge, and the military imposed curfews and roadblocks across the region. They intensified cordon and search operations that turned up weapons caches and intelligence that led to more precise targets and arrests. Various Boko Haram cells in Borno and remote boundary towns and hills were disrupted. There was more precise aerial bombing of Boko Haram strongholds and stronger coordination among Nigerian security agencies. However, security chiefs interviewed for this project believed that the mobile phone shutdown gave them an operational and tactical advantage over the insurgents. Although there is evidence that the mobile phone blackout helped to disrupt Boko Haram’s activities, the dependence of social and economic activities on mobile telephony, as detailed in the following section, should have impelled security agencies to find alternative means of disrupting Boko Haram’s communications. I was more scared throughout the time that the mobile phone was not available. Every time my husband went to work and returned late, I was very scared, not knowing what has happened to him. He is a taxi-driver and sometimes may take passengers to Mubi or Jalingo. He would normally call if he has to stay away late. But during that time we never heard from him till he comes back at night. It got me always worried until he comes back (Focus Group Discussion, Participant GRP4.3). I know a lot of people that lost their livelihoods. Those that sell phone recharge cards were particularly affected. They went out of business. I had a lot of difficulties calling for fruit supplies from Lagos for my shop. I had a box of grapes rotten at the motor park because my supplier sent me fruits but could not reach me to tell me about it. I still wonder how we survived that time. It was very bad (Focus Group Discussion, Participant GRP 4.2). Although citizens said they believed that their personal security and safety were more important than the temporary disruption of their social and business communications, many still expressed anger and frustration at the way the mobile phone shutdown was carried out. I feel that at least for a couple of months it should have been advertised as something that they would do, no matter how secret they wanted it to be, we should know. … So for me, it wasn’t that I was sad, I was angry when it happened (Focus Group Discussion, Participant GRP 1.2). A focus group participant said she felt the region was no longer part of Nigeria: ‘We were cut off from life and from everyone and everything else in Nigeria’ (Participant GRP 6.8). In another focus group, a participant was more critical of the mobile phone blackout. It was a very dumb decision. We use phones more than [the terrorists], so why would you shut down the phones that are more productive towards prevention and say you’re trying to [stop attacks]. It’s not sequential in any way…. It made it easier for us to be targets. … To me it didn’t just make sense; it was not a good decision to take (Focus Group Discussion, Participant GRP 1.3). It is not unusual for Nigerians to blame their president for every misfortune, and the government of President Goodluck Jonathan is unusually unpopular especially in northern Nigeria. Nigerian politics is very closely aligned to ethnic origins, religion and perceived opportunities for patronage. Most people in northern Nigeria see the president, who is from the mainly Christian South South zone, in the Niger Delta region, as a stranger. He carries more blame for the underdevelopment of the northeast region than the powerful state governors and local government executives there. With GSM communications cut off by the military, insurgents, who use Thuraya satellite phone, took advantage of the lack of communications to unleash mayhem on [people]…It took the attack on the air force base in Maiduguri for the military to restore GSM services to the residents of the three northeastern states (Shehu 2014). The astronomical growth of mobile telephony in Nigeria has resulted in complete dependence of both public and private sectors on the smooth functioning of mobile networks. The privatization of the telecommunications industry in Nigeria in 2001 offered the promise of a free liberalized communication network without interference from the state. Whereas the fixed land lines operated by the state monopoly NITEL had various limitations to access, the new mobile phone revolution democratized communications. The major attraction for mobile telephony for most people is the sense of individuality their own mobile phone gives to them. Shutting down the mobile network was equivalent to rending that sense of individuality from them. The Pyrrhic clampdown on mobile telephony reminded citizens that although the ICT sector is liberalized, the state still has the ability, and even the authority, to capture and withhold ICTs based on exigencies of state security. Although most people decried the shutdown, security operatives insisted that the state must exist first before democracy can thrive. And the mobile phone blackout was a means of preserving the state from Islamist insurgency. Viewed from this perspective, while new ICTs serve various desirable ends for Nigerians, their existence is contingent on uses that ultimately support the state’s development and raison d’être. In enforcing the mobile phone blackout across a region the size of England with a population of 12 million for about two months as part of its COIN operations, the Nigerian military proposed that where ICTs serve greater purposes for insurgency or anti-state forces than they do for state security, they are no longer valid for adoption in the society, irrespective of the good they serve. After more than 10 years of using mobile telephony and reordering social and commercial activities to suit the new technology, organisations and individuals had become so dependent on the technology that they had to deploy new measures to circumvent its withdrawal. For organisations that had become dependent on the functioning of the technology, their survival depended on their ability to circumvent the shutdown. The American University of Nigeria in Yola, for example, quickly developed a means of circumventing the shutdown via Skype call centres on campuses so that its staff and students (who are from more than 30 different countries) could maintain communications with parents and loved ones and also carry out various other necessary organisational activities. Individuals also developed their own circumventing strategies. Those that were technologically savvy used Skype, Rebtel, Whatsapp, BBM and other online communication platforms to circumvent the mobile phone blackout. The elites acquired satellite phones, primarily Thuraya, to continue communicating. Those that could not afford circumventing technologies travelled to neighboring states to make essential business and personal phone calls. Those that could not do this resorted to face-to-face communication. For Boko Haram, they developed more intricate and secure means of maintaining communications with their cells. While the shutdown coincided with a reduction in Boko Haram attacks in the short term, it inspired the sect to make the important strategic move of relocating members to the Sambisa forest, which they turned into a stronghold, using captured women and children as human shields in the forest. Moreover, it fundamentally altered the nature of their operations, resulting in a more closed, centralized system rather than the previous open, cell or networked system. Indeed, the development of Boko Haram from a ragtag band of insurgents into a regional security threat was, to an extent, impelled by the sometimes haphazard response of Nigerian security forces. While the mobile phone blackout helped checkmate Boko Haram in the short term, it forced the group to develop new coping strategies and to evolve. Indeed, the shutdown demonstrated the discrepancies of citizens’ uses and gratifications of ICTs with those of the state. Whereas the most paramount rewards of ICTs for citizens is the comfort and ease of social and economic living such technologies enable, the most paramount reward for states, on the other hand, is the ease with which such technologies enable it to assert its authority and sometimes legitimacy. For Nigeria, a country that has suffered several years of military rule, the military’s shut down of mobile telephony is significant and indeed worrisome. In addition to bringing memories of its active involvement in Nigeria’s politics since the first military coup in 1966, it is a reminder that for Nigerian citizens, ICT access is not always a right. It is not enough that the military had good intentions. The mobile phone shutdown disrupted patterns of social living and brought difficult social and economic times on citizens. Given the high level of penetration of mobile telephony in Nigeria, technology has to be a partner in nation building and conflict transformation, not an adversary. 2In November 2013, the US government designated Boko Haram as a terrorist organization; on 22 May 2014 the UN Security Council imposed funding, travel and weapons sanctions on the sect after adding it to a list of designated Al Qaeda entities. 3The State of Emergency has been extended twice, for six-month periods in November 2013 and May 2014. In November 2014, Nigeria’s national assembly failed to approve an additional extension of the state of emergency. 4Anonymous, former member of Boko Haram interviewed for this research project on 16 April, 2014. 5Sect members believed using helmets over their turbans was un-Islamic. 6It is important to note that although the group was not ostensibly violent under Mohammed Yusuf, his fiery messages clearly espoused this ideology. 7Section 305 of the Nigerian constitution empowers the president, with approval from two-thirds of the national assembly, to proclaim a state of emergency in all or parts of the country during threats to national security. 8FGD, 4 May, 2014, Yola Town. 9‘Hailing’ is a Nigerian pidgin English term that describes various complex forms of greetings and praise usually expressed toward a person of higher social status or among friends. 10Although FGDs were conducted about a year after the mobile phone blackout, participants still had a strong recollection of the kind of impact the shutdown had on their daily living and how it made them feel. Eich, Macaulay and Ryan (1994) have observed that when people encode a memory, they not only record the visual and other sensory data, but also store their mood and emotional state in the process. This helps in recollection. 11The Colonel interviewed preferred not to be named, as he was not officially directed to speak. He is based in the operational environment and has been directly involved in leading COIN operations. The authors acknowledge the two Research Assistants on this project, AUN students Zamiyat Abubakar and Maire Abia-Bassey for their contributions, particularly in the organization and moderation of focus group discussions. The authors also acknowledge the support of the ICTs & Governance in Africa research project of the Programme on Comparative Media Law & Policy (PCMLP) at Oxford University and the Annenberg School for Communication, University of Pennsylvania under the Carnegie Corporation’s Program on Local Knowledge in Peacebuilding and Statebuilding. This publication forms part of a special issue made possible in part by a grant from Carnegie Corporation of New York. The statements made and views expressed are solely the responsibility of the author. Adibe, J (2013). Mantzikos, I ed. What do we really know about Boko Haram. Boko Haram: The Anatomy of a Crisis, : 9–15. Available at http://www.eir.info/publication/boko-haram-anatomy-of-a-crisis. Amnesty International (2014). Nigeria: More than 1,500 killed in armed conflict in North-Eastern Nigeria in early 2014. Available at http://www.amnesty.org/en/library/asset/AFR44/004/2014/en/543f7ac9-6889-4f02-bf5a-d73832e04229/afr440042014en.pdf. El-bendary, M (2013). The Egyptian Revolution: Between Hope and Despair: Mubarak to Morsi. New York: Algora Publishing. Filiu, J (2011). The Arab Revolution: Ten Lessons from the Democratic Uprising. Oxford: Oxford University Press. Ghonim, W (2012). Revolution 2.0: The Power of the People is Greater Than the People in Power: A Memoir. New York: Houghton Mifflin Harcourt. Giddens, A (1981). A Contemporary Critique of Historical Materialism. London: Macmillan. Jacob, J U (2010). Rethinking information intervention in violently divided societies: MONUC’s public information operations in the Democratic Republic of Congo. Leeds: University of Leeds. Keller, E B and Berry, J L (2003). The influentials: One American in ten tells the other nine how to vote, where to eat, and what to buy. New York: Simon & Schuster. Mantzikos, I (2010). The absence of state in Northern Nigeria: The case of Boko Haram. African Renaissance 7(1): 57–62. National Emergency Management Agency (NEMA) (). There are 981,416 IDPs in Nigeria. Available at http://nema.gov.ng/there-are-981416-idps-in-nigeria/. Nigerian Communication Commission (). Sim registration. Available at http://www.ncc.gov.ng/index.php?option=com_content&view=article&id=122&Itemid=113. Onuoha, F (2013). Mantzikos, I ed. Understanding Boko Haram’s attacks On telecommunication infrastructure. Boko Haram: The Anatomy of a Crisis, : 16–26. Available at http://www.e-ir.info/publication/boko-haram-anatomy-of-a-crisis. Premium Times (2012). Boko Haram claims responsibility for telecoms attacks, vows to destroy more schools. September 6 2012 Available at http://www.premiumtimesng.com/news/99255-boko-haram-claims-responsibility-for-telecoms-attacks-vows-to-destroy-more-schools.html. Premium Times (2013). Jonathan ignores Governors, Anglican Church, ACN, CPC, others to declare State of Emergency in Borno, Yobe, Adamawa. May 14 2013 Available at https://www.premiumtimesng.com/news/134266-update-jonathan-ignores-governors-anglican-church-acn-cpc-others-to-declare-state-of-emergency-in-borno-yobe-adamawa.html#sthash.7clw9OJ8.dpuf. Rogers, E M (2003). Diffusion of Innovations. 5th ed. New York: Free Press. Thompson, J (1995). The media and modernity: A social theory of the media. Cambridge: Polity Press.